It must be annoying when your iPhone screen is cracked, what is more frustrated is that, you can't even enter your screen passcode in order to access it. Don't be despondent now. In this article, we'll cover 4 possible solutions to help you unlock an iPhone passcode when your broken is broken, cracked or unresponsive. To fix iPhone screen broken can't unlock problem, you can simply use a professional iOS unlock tool to do the job. Joyoshare iPasscode Unlocker can easily unlock iPhone passcode when the touch screen is broken and unresponsive. 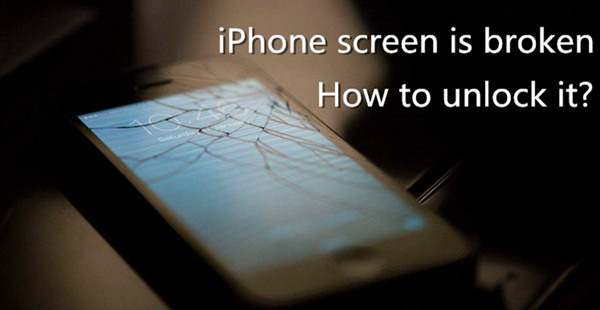 It uses a very simple method to bypass the screen lock and help you get into your broken screen iPhone within a few minutes. Plus, it will not ask any password or prompt during the unlocking problem, no restriction at all. No matter your screen passcode is a 4-digit or 6-digit numeric one, or more complicated Touch ID, Face ID, Joyoshare iPasscode Unlocker can remove the screen lock in a few clicks. 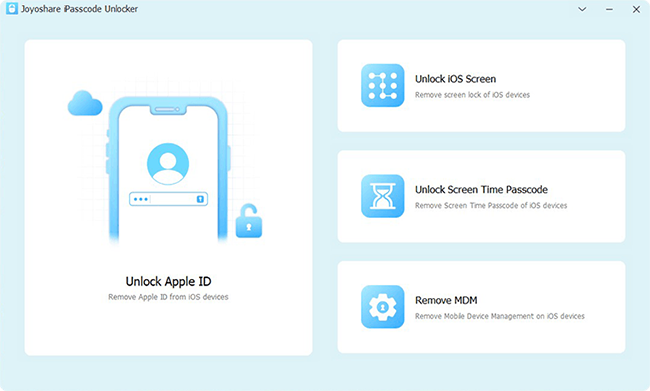 Besides, this program is fully compatible with almost all iOS devices and systems, ranging from the oldest iPhone 4s to the newest iPhone XR, XS or iPad Pro and iOS 12. Now let's move to the detailed instruction on how to unlock iPhone with unresponsive screen by using Joyoshare iPasscode Unlocker. At first, you can download and install Joyoshare iPasscode Unlocker on your PC or Mac. Use an original USB cable to connect your iPhone to the computer. Open Joyoshare and it will detect your device. Click the "Start" button to begin. 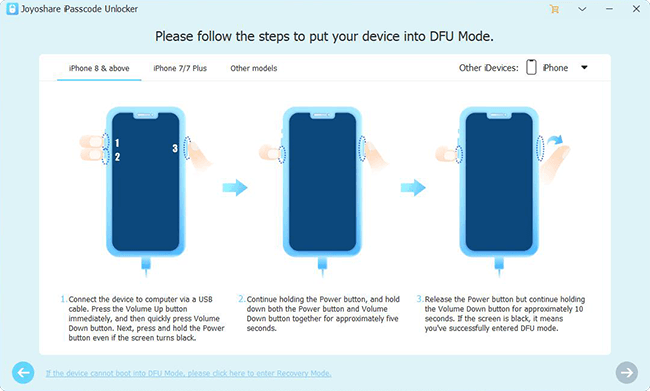 Follow the instruction on the interface to boot your broken iPhone to the DFU or recovery mode manually. If it failed, you can freely use Joyoshare UltFix to help your device enter the recovery mode in one click. Then hit the "Next" button to proceed. Once your device is in the recovery mode or DFU mode, you can check the device info and correct it if there is anything wrong. 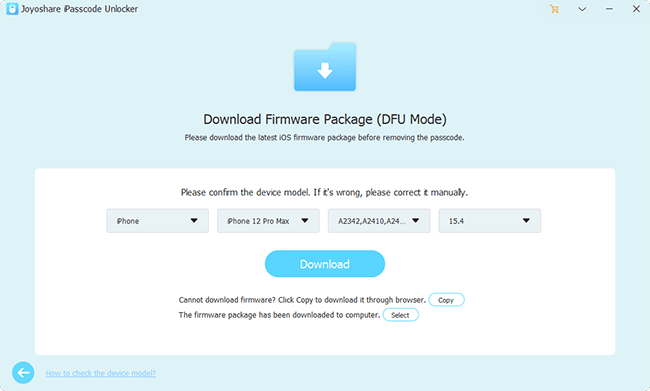 Afterwards, press on the "Download" button to download and verify the firmware package. Wait until the download is completed, and then you can click the "Unlock" button to start unzipping the firmware package and unlocking your iPhone. Once it's done, you can get access to your iPhone again. Note: Using Joyoshare iPasscode Unlocker to unlock broken screen iPhone will wipe all the data and settings on your device, and the iOS will be updated to the latest version. 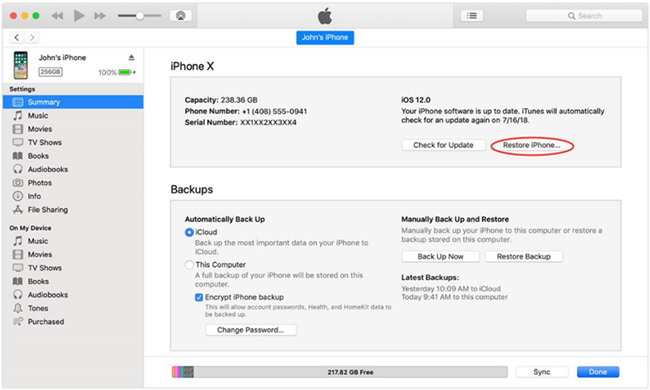 You can now recover your data by restoring an iTunes or iCloud backup. Another method to bypass iPhone screen lock is to use iTunes to restore your device as long as you have ever synced it to a computer and trust this computer. Here is how: If you have once synced your device to the trusted computer via iTunes, you're probably going to try unlocking iPhone XR/XS (Max) with iTunes. Just go to open iTunes and connect your iPhone to the computer. Simply hit the device icon after it detects your iPhone and navigate to the "Summary" > "Restore iPhone...". Confirm the "Restore" option to factory reset your device. Your passcode will be removed then. Step 3. Click the "Restore" button again and reset your device to the factory settings. When the process finishes, all your data will be effaced and your iPhone can work normally. Step 3. Choose the "Erase iPhone" option to erase all content and screen passcode remotely. When your iPhone screen is broken and unresponsive, you can also use Siri feature to get access to it. Yet, it will not always work for all iPhone users, according to the report from many customers. You can still give it a try, what if you're the lucky one? Step 5. Swipe to highlight enter or done and double hit to submit the password. The above are all possible solutions to unlock iPhone passcode when your iPhone is broken and unresponsive due to system issue. The first three methods will erase all your data while the last one will not, but it is somewhat complicated and not 100% workable. 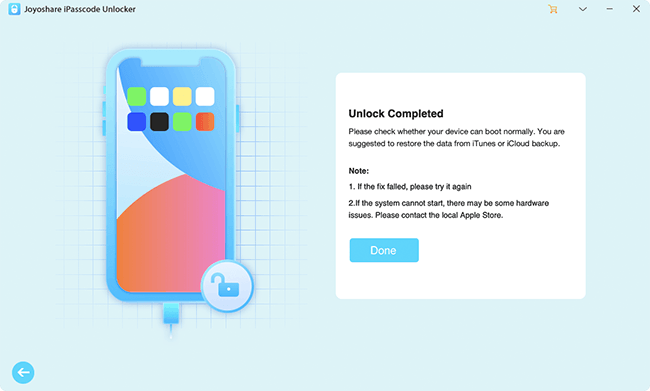 We suggest you to try Joyoshare iPasscode Unlocker to unlock iPhone with broken screen because it's easy to operate and have a high success rate. However, if your iPhone screen broken can't unlock issue is caused by some hardware malfunction, you'd better take it to the offline Apple Store or professional repair store. Don't repair it by yourself, or you may damage it.